(1) Slight glomerular proteinuria; (2) albumin only; (3) normal serum control; (4) probable monoclonal protein (uIFE identifies λ FLC); (5) tubular proteinuria (uIFE negative); (6) slight tubular proteinurea (uIFE identifies IgGκ plus κ FLC); (7) query monoclonal protein (uIFE shows κ banding, no monoclonal protein detected). Urine protein electrophoresis (UPE) and urine immunofixation (uIFE) use essentially the same gels and equipment as SPE and sIFE. UPE produces a heterogeneous range of patterns depending on the presence and relative concentrations of proteins including albumin, glomerular and tubular proteins, monoclonal FLCs (urinary Bence Jones protein, uBJP) and polyclonal FLCs (Figure 4.7.) . There are wide variations in laboratory protocols for UPE. These include the use of 24-hour vs. random urine collections, with or without urine concentration, and with or without correction for creatinine excretion . Difficulties associated with 24-hour urine collections are further discussed in Section 24.3. Whilst some guidelines recommend that urine aliquots from 24-hour collections are concentrated (up to 100-fold) prior to electrophoresis , many laboratories routinely use neat random urine samples for analysis. The concentration of uBJP is calculated using scanning densitometry in combination with total protein measurements. With optimal conditions, UPE can detect monoclonal FLCs at <20 mg/L, although most laboratories claim a detection limit in the region of 40 - 50 mg/L. In practice, high concentrations of background proteins and “ladder banding” caused by polyclonal FLCs prevent attainment of the ideal sensitivity. In addition, false positive UPE results may be produced by a variety of proteins including β2-microglobulin, and lysozyme . Therefore, the visual interpretation of electrophoretic gels presents many challenges, even to experienced users. 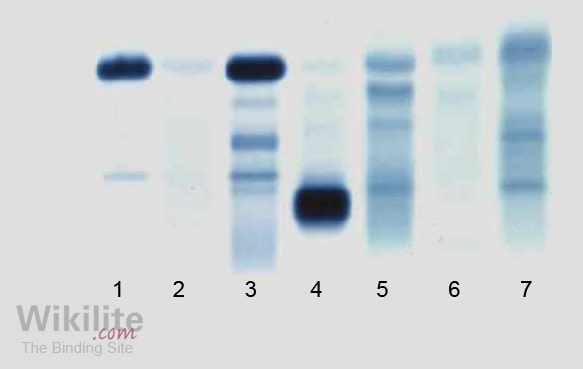 As with SPE, the presence of any suspicious band after UPE requires IFE to determine the identity of the protein. Compared with SPE, UPE produces many more "false-positive" bands which are found not to be monoclonal FLC or immunoglobulin after performing uIFE . Urine electrophoresis is required for all patients if a diagnosis of MM is established . However, some patients with plasma cell dyscrasias produce only small amounts of monoclonal FLCs, so little, if any, passes the absorptive surface of the renal proximal tubules (Chapter 3). As a result, these patients may have undetectable levels of FLCs in the urine, and sFLC immunoassays are usually preferable (Chapter 24). It is important to note that small amounts of monoclonal FLCs have occasionally been identified in the urine of some AL amyloidosis patients with normal sFLC ratios. This is further discussed in Section 7.7.1. FLC immunoassays can be used on urine samples as an alternative to urine electrophoretic tests. However, urinary FLC immunoassays do not solve any of the practical problems of urine collection or overcome the influence of the renal threshold for passage of FLCs into the urine. Indeed, the broad normal range for the κ/λ FLC ratio in urine (Section 6.4) ensures that uIFE is usually more sensitive for the detection of monoclonal FLC. For this reason, international guidelines do not recommend the measurement of urine FLC levels (Chapter 25) . This is further discussed in Chapter 24, which brings together all the arguments for the use of serum rather than urine for the measurement of FLCs. What assays are available to monitor patients with small monoclonal immunoglobulins that co-migrate with other serum proteins? What UPE artefact can be associated with the presence of polyclonal FLCs in urine? Total immunoglobulin assays and HLC assays (Sections 4.4.1 and 4.2.5) .